Candidates who are 16+ and are currently doing some supervised work experience. Candidates who are currently in probationary periods in their current employment. This gives employers time to assess if the candidate is right for their job. Candidates who do not currently have a CSCS Card but are working as a labourer. 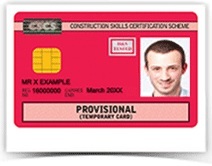 In order to obtain the card, candidates must have passed the CITB Health, Safety and Environment test, within the past two years. Important: It is expected that before the card expires candidates must achieve or be registered for a construction related qualification. They must also then apply for the appropriate CSCS Card for their job.